The first Eyes On ratings, measuring how many people see outdoor billboards, debuted four years ago. Since then the name of those ratings has been changed to TAB Out of Home ratings, and they’ve become accepted currency in out of home media buys, providing the first comprehensive picture of how many people see billboards, bulletins, posters and other types of outdoor media. Now the Traffic Audit Bureau of Media Measurement is readying its first update to those ratings. In the coming year, TAB will roll out a new system to measure digital billboards, a small but growing slice of OOH. It’s also releasing its first batch of transit ratings next year. They’ve been a long time coming because of the added wrinkle of having to measure something that’s moving instead of something that’s stationary. Joe Philport, president and chief executive officer at TAB, talks to Media Life about the challenges of developing new ratings, his hopes for digital billboard measurement, and the big issues facing the ratings industry. As it stands now, how many billboards are you measuring? Just under 400,000. When you say billboards, let’s put a context to that. That includes bulletins and posters, it includes transit shelters and other types of street furniture. Those are the primary formats we’re measuring now, mostly roadside inventory. How has the measurement system changed or adjusted in the years since it was rolled out? We’re a not-for-profit organization that’s been around for many years. We used to do a measure of gross circulation of people passing the inventory that I mentioned. They were very accurate and qualified counts. They took into consideration where the boards were located, but it was gross volume. A few years ago we introduced Eyes On, which is now TAB Out of Home Ratings. They were based on a request to develop a system comparable to ratings for other local media. That meant we had to include the demographics and where those people were coming from so we could report reach and frequency. The reason we called it Eyes On at the time is we moved from gross circulation to people who were actually noticing the ads. That was the baseline system we introduced several years ago. We’re about to release our first update of the system, which is processing–what we have to do to accurately measure people seeing the boards is generate trip paths, which come from the American Community Survey and a national transportation study, which gives us millions of respondents of trips on roadways across the U.S.
Do you measure digital billboards differently? If so, how? How do you account for changes in advertisers on the boards (i.e., the ad may flip to a different advertiser every few seconds)? No, but they will be. This is the second major enhancement we’re doing. When we introduced Eyes On (the reason we changed the name is people didn’t understand what Eyes On meant), but when we introduced it the penetration of digital was very low, and in fact it still is. In our current system the measure for the digital billboard is for the structure, not the ad. In early 2014 we will introduce new ratings for digital bulletins based on people who are noticing the specific ad unit rather than the structure. In order to do that there are two components, the first taking into consideration the dwell time people spend when passing billboards at various times of the day. This will apply not just to digital but to static inventory as well. Right now eye-tracking research is based on the assumption that you’re passing at around the speed limit, but now with digital we can look at it on an hour-by-hour basis and the speed throughout the day. Speed will affect the likelihood that you’ll notice a structure if it’s static or specific ad if it’s digital. In order to do that we’re doing a second wave of eye-tracking research, which was done in Atlanta and Dallas. We licensed data from INRIX [a traffic data and technology company], which has speed data on roadways throughout the country on an hour-by-hour basis. We’re going to be looking at speed on about a quarter of a million miles of highways and interstates across the country. You recently rolled out transit measurements. What sort of results did you see from those? Is that an area buyers have expressed interest in? Buyers have expressed significant interest in transit as the out-of-home media form they were most interested in expanding to, beyond the ones I already mentioned. We just finished compiling and the rollout will begin in a phased approach and will be introduced in our measurement system at the first of the year. One of the reasons is it’s very complex. With transit we’re looking at bus interior advertising, rail interior advertising, stations and bus exteriors. I put bus exteriors last because there’s where the complexity comes in. If you take the DOT system in Los Angeles, we’re processing bus circulation covering routes of 2,600 bus stops and over 500,000 incidents of buses stopping at those locations each week. We have to figure out the volume of pedestrian and vehicular traffic that passes the bus and sees the advertising. So it’s quite a bit of work. What we anticipate is by the end of the year we’ll release data for 68 of the largest transit systems in the country. We’ll be in 26 DMAs in early 2014. One of the issues is our members have to decide how they want to use this information to package how they sell their inventory. Right now we’re in a soft release phase, a phase of assessment, for the numbers that will be used commercially. The primary challenge is we have to measure advertising that’s moving. Once we have successfully rolled that out for buses, we can apply the same know-how to measure other forms of moving advertising. What sort of adjustments or changes did you make to measure transit as opposed to billboards? The biggest one is it’s one thing to figure how to measure stationary inventory, and it’s quite another to figure out how to measure ads as they move throughout the market. That’s the primary challenge. How do you distribute the ratings? Can anyone access them? Do you have to pay for them? Because we’re a not-for-profit organization, our membership gets access to the ratings. Members include out-of-home media companies, advertising agencies, and major advertisers. The information is available in various forms. For example the ratings are available in the primary planning systems offered by Nielsen IMS and Telmar. What do you see as the big issues in out of home measurement right now? I’m pausing because I think the big issue for our industry is actually the mainstreaming of out-of-home measurement throughout the advertising community. Part of it is increasing awareness in the general ad arena. In terms of our biggest challenge, it’s basically how we leverage new measurement technology and techniques to bring more insight about out-of-home to the whole of the ad community. 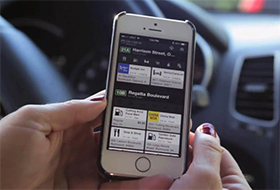 One way is to fuse OOH ratings into ratings services such as Nielsen or MRI. Other media have ratings in those databases, so you can take a view across media. But those systems right now only have surrogates for OOH. By fusing data into those databases it will help get a better understanding of how OOH works in relationship to other media. The other area we’re looking at is the availability of new measurement capabilities to make ratings more timely and exhaustive. The beauty of it right now is that we have standardized ratings that consistently measure the out-of-home formats I mentioned throughout the country. Now we’re aligning the ratings with the ratings of other local media. We also have a platform that we designed where, as techniques improve, we can plug new ways of measuring into our system. The best example I can give you is with transit. Bus exteriors would have been impossible to do years ago, but now that routes are digitized we can go in and get a good methodology for measuring something as complex as the LA DOT. Several years ago, doing that would be cost prohibitive. Regarding the media industry as a whole, what are the major issues in media measurement right now? I’ve been in my little silo, but over my career many years ago I worked at both Arbitron and Nielsen at a time when radio and TV were very different than they are today. Social media and mobile had not taken hold. So the challenge of media measurement is the challenge of the communications paradigm. I guess the challenge is you can’t look at ratings in a vacuum. The challenge of commercial communication has become so complex, so personal, so locally focused–this is one of the reasons I think out-of-home will thrive, by the way. Out-of-home is the localized medium, so the ability to pinpoint advertising is just huge. I think the challenge of media measurement is everything is so personalized and portable today. Just when you get hold of what media are, it changes. It’s a very complex but exciting arena. You hear about data mining and big data, everyone wants to rush there. But it’s really complex and extracting useful knowledge from massive amounts of data is the wave of the future. It’s here today, but it’s far more complex than it appears on the surface level. 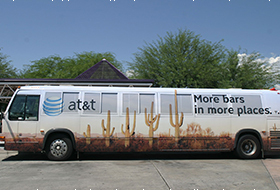 Commuters in Tucson, AZ, will see eye-catching ads on buses for the next five years thanks to a new transit advertising contract. Lamar Advertising Company (Nasdaq: LAMR), one of the nation’s largest out-of-home media providers, today announced its new transit advertising agreement with Sun Tran.